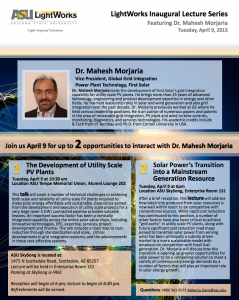 Join ASU LightWorks for two opportunities to engage with Mahesh Morjaria, vice president in Global Grid Integration at First Solar. 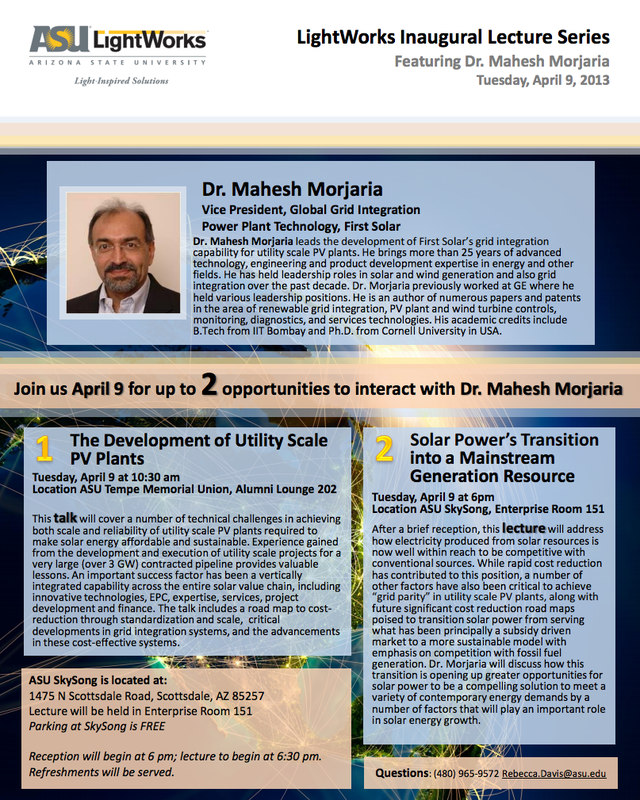 ASU students, faculty and researchers can participate in a technical talk and lecture addressing the development and integration of utility scale PV technology and its transition as a mainstream power source. In this presentation, Dr. Morjaria will discuss a number of technical challenges that have been addressed and need to be addressed to achieve both scale and reliability of utility scale PV plants required to make solar energy affordable and sustainable. The experience gained through development and execution of utility scale projects for a very large (over 3 GW) contracted pipeline provides valuable lessons. An important success factor has been a vertically integrated capability across the entire solar value chain, including innovative technologies, EPC, expertise, services, project development & finance. It also includes a road map to further cost reduced thin film solar modules that have provided superior performance especially in hot climates, as well as significant reduction in non-module cost and project development costs through standardization and scale. The development of advanced grid integration systems that enable utility-scale PV power plants to more easily connect to the grid and provide grid operators with reliable and stable electricity has also been critical. These systems enable the PV plant to become a truly complementary generation asset that integrates cost effectively into an existing or evolving generation portfolio. These advancements will be presented. Electricity produced from solar resource is now well within reach to be competitive with conventional sources. While rapid cost reduction in PV technology has contributed to this position, a number of other factors have also been critical to achieve this “grid-parity” position in utility scale PV plants. These factors, honed through development and deployment of large utility scale plants, include PV plant design and optimization approaches, grid integration capability, engineering, procurement and construction (EPC) as well operation and maintenance (O&M) capability. These factors along with future significant cost reduction roadmaps are poised to transition solar power from serving what has been principally a subsidy driven market to a more sustainable one with emphasis on competition with fossil fuel generation. In this presentation we will discuss how this transition is opening up greater opportunities for solar power to be a compelling solution to meet a variety of contemporary energy demands. Factors such as fossil fuel savings, optimization of energy infrastructure, the ability to add new power resources quickly, energy security and off-grid access will play an important role in solar energy growth. Mahesh Morjaria leads the development of First Solar’s grid integration capability for utility scale PV plants. He brings more than 25 years of advanced technology, engineering and product development expertise in energy and other fields. He has held leadership roles in solar and wind generation and also grid integration over the past decade. Morjaria previously worked at GE where he held various leadership positions. He is an author of numerous papers and patents in the area of renewable grid integration, PV plant and wind turbine controls, monitoring, diagnostics and services technologies. His academic credits include B.Tech from IIT Bombay and Ph.D. from Cornell University.